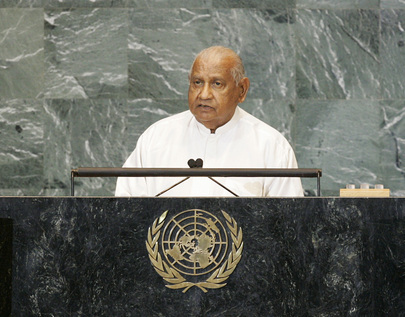 RATNASIRI WICKRAMANAYAKA, Prime Minister of Sri Lanka, said significant development had taken place in Sri Lanka this past year, and he took the floor “with renewed hope and optimism for my country”. After three decades of combating terrorism, the Government had successfully defeated the Liberation Tigers of Tamil Eelam (LTTE), liberated the Vanni region that had been under LTTE’s control and returned over 290,000 civilians to their homes. As terrorism was a transnational criminal network and a shared global challenge, this accomplishment not only meant peace and security for Sri Lanka but to all nations throughout the world. One of the highest priorities after the defeat of LTTE was to meet the humanitarian needs of the displaced civilians. He went on to say that the task had been facilitated by the assistance of United Nations agencies, international and local civil society partners and donors. In the process of restoring the region to its people, over 54 agencies were engaged in humanitarian efforts, and for the first time since LTTE control children were being educated. From past mistakes and experiences, in order to ensure a safe and sustainable resettlement, Sri Lanka had learned such restoration programmes could not be rushed. Because of LTTE landmines and other explosives placed in civilian areas, the time-consuming and meticulous process of demining was under way. Continuing, he stated that long term peace and security would only be successful if reconciliation took place. Sri Lanka was committed to taking all measures, according to international human rights standards, to ensure such actions were taken, and he was pleased to note that, in three months, significant progress had been made. Another initiative was the national campaign “Bring Back the Child”, an extensive rehabilitation programme for former child combatants. Farmland and fisheries were also being re-established and restored. With formerly inaccessible roads now reopened, the economy of the north was being integrated with the rest of the country, and the eastern province after many years had begun to contribute to the national economy. Sri Lanka’s experience with terrorism lent it great insight into the threat facing the international community, he said. Much of the funding LTTE had received came from overseas through a complex range of criminal activities, amongst them, drug and human trafficking, arms procurement and illicit trade. The Sri Lankan navy was responsible for confronting and interdicted virtual floating warehouse of arms and ammunition. This phenomenon called for a revision of existing international laws pertaining to the boarding and searching of vessels in the high sea. It was clear that, in order to meet such threats to peace and security effectively, concerted and well-coordinated efforts by the international community was essential to stop multifaceted criminal networks of terrorist organizations. To that end, he called for the finalization of ongoing negotiations of the draft comprehensive convention on terrorism. He then addressed the recent global financial and economic crisis that was rooted in the developed countries, but had significant impact on developing countries. Although Sri Lanka was able to minimize the impact on its own economy, the crisis highlighted the need for transparent multilateral regulatory structures in the world economy. Furthermore, long before global adoption of the Millennium Development Goals, Sri Lanka had been well on track to reaching its targets in several areas. The investment into human resources, gender equality and social development continued to be of utmost importance in its national agenda and the Government was determined to continue its progress. Turning to climate change, he stated that the “carbon debt” owed to them by the developed countries could be used to finance the financial and technological assistance to adapt their own industries to a sustainable path. He concluded by saying that the United Nations and, in particular the General Assembly, had been entrusted from the Charter with the responsibility to maintain international peace and security. He expressed disappointment at the little progress made with the implementation of resolutions regarding the inalienable rights of the Palestinian people to statehood, but felt encouraged by President Obama’s remarks on the issue. In such a critical time, he urged Member States to “mobilize the political will to shed our differences and work in a spirit of cooperation to respond effectively and swiftly to the challenges that confront us”.